With my award winning Bahama Mama. 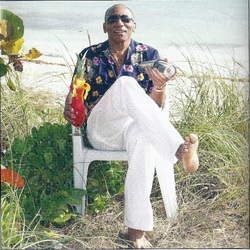 My name is Oswald Greenslade and I have been a bartender in The Bahamas for over 50 years. For the first time ever, I am sharing all my original cocktail recipes with you. Not only am I giving you the secrets to many years of success, but I am also going to share with you a brief history lesson of The Bahamas. I hope you relish this unique insight of The Bahamas and enjoy the new drink recipes I now pass on to you. And, remember - It is Better in The Bahamas!